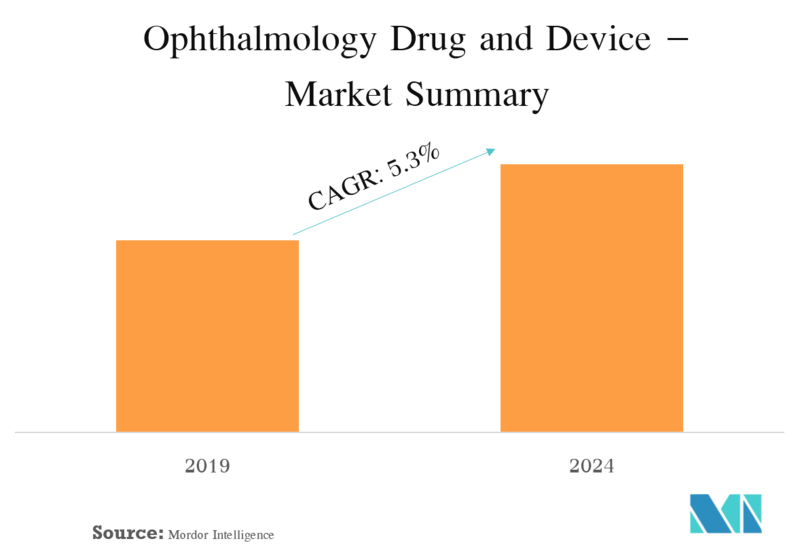 The ophthalmology drug and device market is expected to witness a CAGR of 5.3% during the forecast period. Certain factors that are driving the growth of the market include demographic shift, impact of the prevalence of eye disease, technological advancements in the field of ophthalmology, and rising geriatric population. Cataract volume registered a rapid increase in recent years. The aging population is expected to burden all areas of health care, and ophthalmologists provide approximately 90% of their procedure-based services to seniors. In many countries, cataract surgery is the most frequent surgical procedure performed, and it offers significant improvements in the quality of life of the elderly population at low costs. 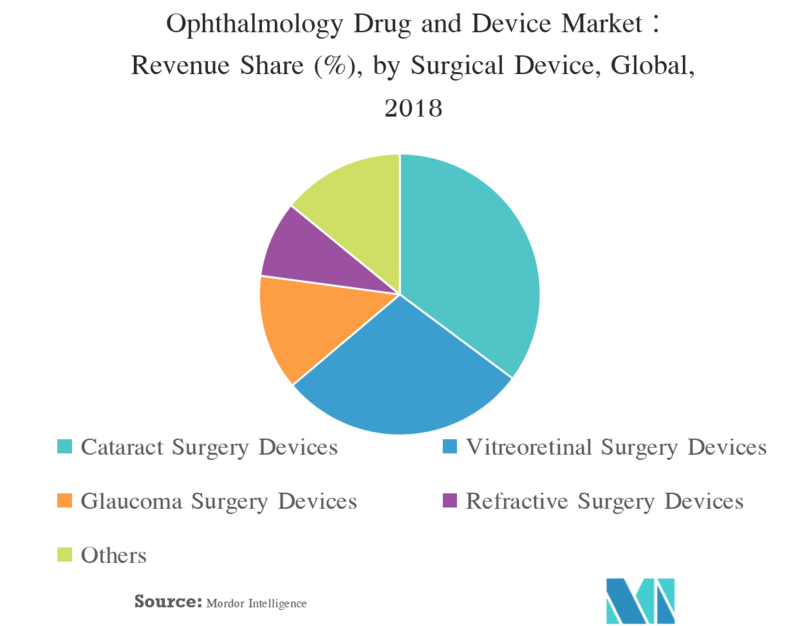 An increase in the demand for ophthalmological devices projects the future cataract surgery needs that are vital for human health resources and hospitals, and for surgical center management and planning. Other factors, such as the availability of new drugs and devices and the prevalence of eye disease, are also expected to drive the market over the forecast period. Many regulations are imposed by agencies, such as the FDA, to ensure the safety and efficacy of products. Due to frequent occurrences of violations, tighter regulations were enforced on the label contents. The cost of complying with FDA guidelines is expected to drive many small pharmacies out of business or force them to consolidate. For example, these regulations impose a beyond-use date of only five days for bevacizumab and other biologics. However, it takes 14 days just to test the sterility of these drugs, which means that the regulations for compounded ophthalmology drugs besides bevacizumab, such as ophthalmology mitomycin, and triamcinolone acetonide plus moxifloxacin hydrochloride injection, will become much more expensive or even unavailable. Additionally, increasing healthcare cost and economic slowdown in developed countries are also restraining the market’s growth. Ophthalmology is a branch of medicine that deals with the anatomy, physiology, and diseases of the eye. Ophthalmologists, who are specialists in medical and surgical eye problems, perform operations on eyes. They are specially trained to provide the full spectrum of eye care, from prescribing glasses and contact lenses to complex and delicate eye surgery. The devices include glasses, lenses, diagnostics, lasers, solutions, and surgical instruments. According to the Royal College of Ophthalmologists, the United Kingdom, around 330,000 cataract operations are performed each year in England alone. It has been estimated that 30% of people aged 65 years or more have a visually impairing cataract in one or both eyes. Some populations tend to have a much higher prevalence of cataracts. For instance, 77% of the British people, aged 42 years or older, originating from the Indian subcontinent have cataracts. There is a threefold variation in the number of people having cataract surgery across England, owing to differences in health commissioning policies. Similarly, as stated by the American Academy of Ophthalmology, approximately 24.5 million people in the United States have cataracts, which is the leading cause of blindness in the United States. Cataract surgery remains the most effective way to help restore vision for these people with cataracts. Due to the presence of well-established healthcare facilities, the rise in geriatric population in the region, and certain other factors, North America dominates the ophthalmology drug and device market. Owing to the constant increase in the American elderly population, as well as a movement toward vision correction and its usage among key demographics, an absolute increase in usage rates for most types of eyewear was observed in the United States. Additionally, the government of Canada states that the average revenue of the small and medium-sized enterprises, primarily engaged in retailing and fitting prescription eyeglasses, was found to be USD 565.2 thousand, in 2016, whereas the profit was around 77-78%. 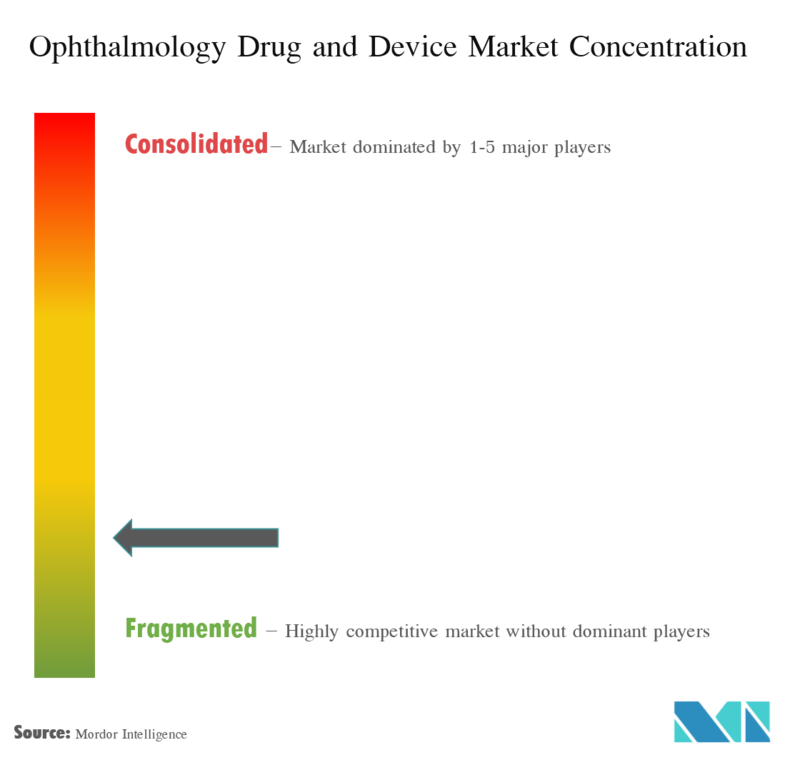 The ophthalmology drug and device market, which is highly competitive, consists of a number of major players. 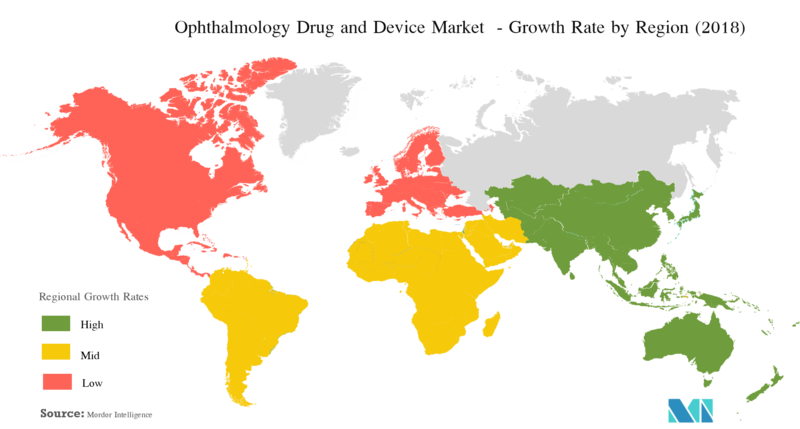 Companies, such as Alcon Inc., Bausch & Lomb Inc., Johnson & Johnson, and Carl Zeiss Meditec AG, among others, hold substantial market shares in the ophthalmology drug and device market. Recently, various developments have been taking place in the market. For instance, in November 2017, Bausch & Lomb got Vyzulta approved for reduction of intraocular pressure in patients with open-angle glaucoma or ocular hypertension. Moreover, in November 2017, Zeiss introduced the cloud-based cataract surgery planning platform, Veracity Surgical, and announced the integration with leading EMRs. 6.1.2 Bausch & Lomb Inc.